Yoga teachers are generally a pretty healthy lot so it’s easy to forget that 40% of Americans have a chronic illness. Being one of the 133 million people in this country with a chronic disease, as well as a yoga teacher, I’m more sensitive to the unseen issues students might have when they step on to the mat. Yoga is an amazing tool for managing many chronic diseases, but as yoga teachers, we need to do more to make our classes accessible to all students. If this sounds intimidating, remember it’s not about remembering a vast number of medical facts and yoga contraindications, as much as it is just a subtle shift in our attitude. We don’t know what our student’s needs are unless we’re listening to what they’re telling us. If our students need help with a particular posture we need to hear that. If they’re expressing fear or concern we need to reassure them. If they’re saying one thing verbally but their bodies are saying something different, we need to listen to both. One day when I was changing in the locker room, a woman in the next aisle asked a friend to borrow a beach towel because she had grabbed the wrong one that morning and hers didn’t cover her “assets and liabilities.” The woman should’ve copyrighted the phrase because it’s a great way of looking at ourselves. We all have assets and liabilities. As a teacher, we have to help our students accommodate theirs. Student safety should be a number one priority. Try phrases like “Do what you can” and “Make it your practice.” The cues are suggestions for their journey unless it looks like they actually are getting unsafe and then it’s time to get quite insistent. Sometimes it’s appropriate to use a lot of props. Props keep people comfortable, safe, and build body awareness. Props are our friends. Our classes and private sessions are about our students, not us. We’re not there to wow them with a posture or name dropping. Keep their egos in check too; like really, really, really encouraging them to take the bloody prop. If a student needs help with a particular posture, we need to help them when they’re in that posture, not 15 minutes down the road. When the tenor of the class is showing a little bit of frustration or overwhelm, we need to back off. If everyone is sleepy, we need to jazz it up. If something didn’t work for a student, notice that and try something else. The important part is saying yes to the yoga, the details can be worked through. We don’t have all the answers. When we don’t know the answer to a student’s question, it’s okay to admit that. Do the research, and then get back to them. Make the assumption that everyone in your class has challenges. They might be physical, mental, or emotional but we’ve all got our baggage. It’s like at the airport when all the bags go around on the carousel and they go grab theirs and it’s too heavy. We need to be that dream porter who appears and helps them with their heavy bag. While we wheel it around for them, hopefully we can teach them how to pack lighter for next time. At the end of the day, making yoga accessible is just about being the best teachers we can for the students in front of us. has been practicing yoga for over 25 years. Because of her health struggles, she’s passionate about helping people with health challenges, like arthritis, thrive in spite of their diagnoses. 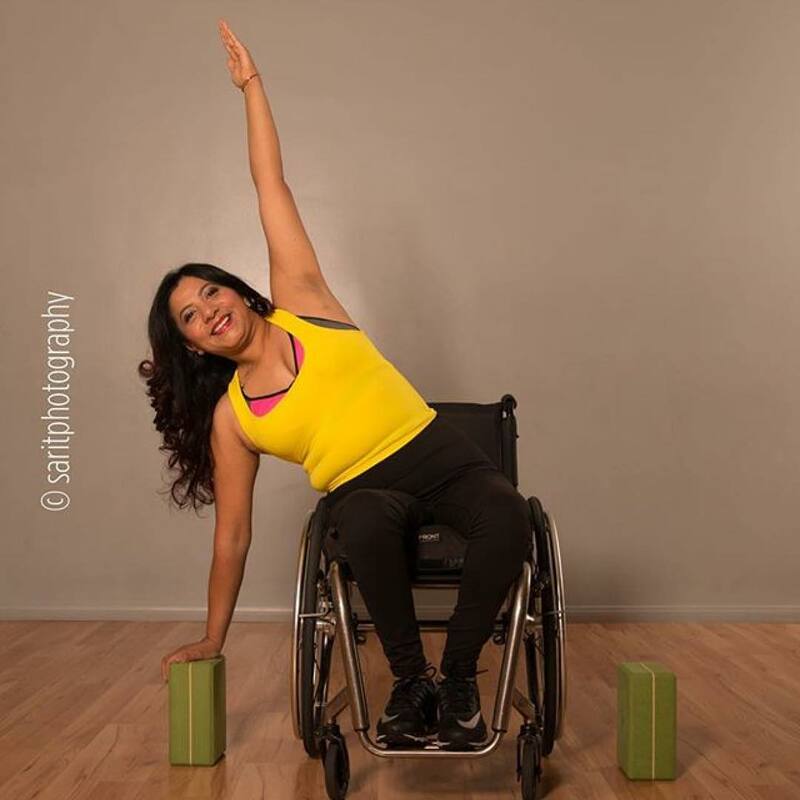 It makes her day to introduce someone to yoga for the very first time or make yoga more accessible to underserved audiences. Her basic needs include tea and books. She reaches out to the world at www.beecontentyoga.com. This post was originally published by Sivani East.